Thousands of discounted used, bargain, and collectable books! It′s that time of year again! 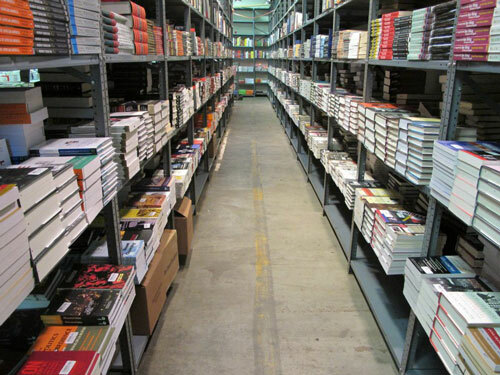 Harvard Book Store is thrilled to be opening the doors once again to our Somerville warehouse on Saturday, December 7, and Sunday, December 8. We′ll have a fresh inventory of used, bargain, and collectable books—and everything is on sale! Whether you need to make some progress on your holiday shopping list or you′re just looking to stock your own shelves with some new and unusual finds, join us bargains galore and thousands of books to discover. If you joined us for our Warehouse Weekends series this past fall, you'll be greeted by some familiar (and new!) faces in our back room; we've asked back a fabulous group of local partners to add a little something extra to the event! Partners include Boston Comics Roundtable, Million Year Picnic, Cool Kids Club (DJ-ing), The Biscuit, Grillo's Pickles (Saturday only), Scoopsies Ice Cream (Sunday only), and Taza Chocolate (Sunday only). And while you're in the area, be sure to check out the Holiday Craft Markets at our neighbors, Brooklyn Boulders and the Artisan's Asylum. Please note that gift cards and Frequent Buyer discounts cannot be redeemed at the Warehouse Sale. We apologize for the inconvenience. Our warehouse is located on Park St. in Somerville, just off Somerville Ave. The closest T stop is Porter Square, on the Red Line, and bus lines #83 and #87 have stops on Somerville Ave. near Park St.
Twitter users: Tweet your favorite finds at our winter warehouse sale using #HBSWarehouseSale. We'll pick one winner from each day to receive a $25 Harvard Book Store gift card! Follow us on Twitter at @HarvardBooks.